HONDIUS - Nova Virginiae Tabula. HONDIUS, H. - Nova Virginiae Tabula. Nova Virginiae Tabula. - HONDIUS, H.
Title : Nova Virginiae Tabula.. Date : Amsterdam, ca. 1636. Colouring : In very attractive original colours. 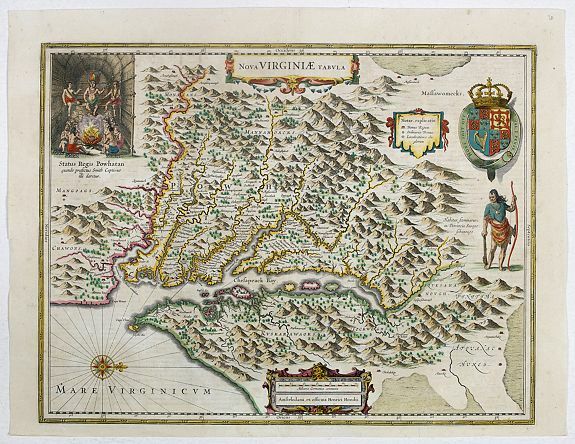 Description :One of the most important maps of the Chesapeake Bay region, credited with disseminating knowledge of the English settlement in Virginia throughout Europe in the 17th century. This is the fifth of the many derivatives of Captain John Smith's map of Virginia, the earliest true map of the first permanent English colony in America. In the upper left corner is an engraving of the great Indian chief Powhatan seated on his throne and surrounded by his subjects. A Susquehanna chief is depicted on the right under a coat of arms and cartouche. This is Henricus' version based on the map drawn by Jodocus Hondius Jr.
Compass rose in the lower left corner. French text on verso. Burden, The Mapping of North America 228, state 1; Koeman, Atlantes Neelandici Me 31 A #72; Taylor, American Colonies, p. 125-132; Verner, 165-166. Condition : Light browning of the paper. Original colours a bit touched up. Good impression. Overall very good condition.